Hi guys, I have received a lot of help from people on the forum so I figured I could at least share something with you. When I first bought my F2 I noticed there was rust in the tank. After removing the carbs I found a lot of rust in the float bowls, fuel lines, and any other parts that came into contact with gasoline. I know a lot of people have different opinions on how to fix a rusty gas tank but this was my process, and my results. I started with removing the fairings, and gas tank..... obviously. Undo the petcock, and drain all of the gas in the tank. You have to shake it around a bit and try to get out as much as possible. DO NOT save the gas because if you are doing this then there is obviously rust in your tank which means there is rust in your gas. After letting my gas sit for a few days in a lemonade jug all of the rust settled to the bottom, and was very visible. To clean the tank use hot water and dish soap. Go somewhere that you don't mind killing off some grass, and flush out the remainder of the gas tank with a hose then proceed with the hot water and soap rinse. After the hot water and soap rinse it out with the hose again. Now you need to dry the gas tank COMPLETELY. If there is any moisture left in the tank then sealers will not stick. What I did was lay my tank on the ground so the petcock side was in the air, and then I stuck the exhaust end of a shop vac into the filler hole. Make sure you are doing this in a well ventilated area because any gas residue in the tank will still be clearing. Also be careful not to get dust/dirt/ grass etc... in the tank. After an overnight drying (just to be safe) prepare to seal the tank. I spread out a bunch of cardboard on the lawn. Get a couple of old chairs or something that will allow you to place a bucket underneath the tank to catch any drips. I would also recommend a small siphon of some sort to extract the excess sealer. The petcock opening has a lip which makes it close to impossible to get the tank 100% empty. You definitely need a crap ton of extra rags/ towels/ napkins, whatever you want to use. THIS IS REALLY MESSY WEAR GLOVES AND BE CAREFULl OF THE CHEMICALS. The next step is to tape up any holes. I used regular duct tape. Tape the petcock hole, the overflows, and the vent (just to be safe). I also taped up the overflow in the filler compartment, and the screw holes just in case I spilled. 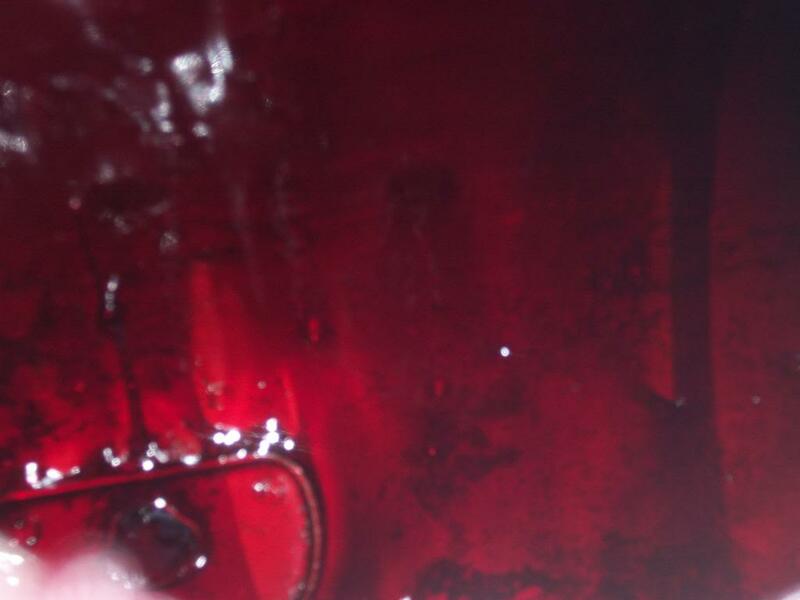 My sealer of choice was Red Kote. There are a lot of products on the market, including the well known KREEM, but I heard good reviews of this product, and not so good reviews of the more popular products. Red Kote was like $40 from amazon and it is bright red to help you see it in the tank. 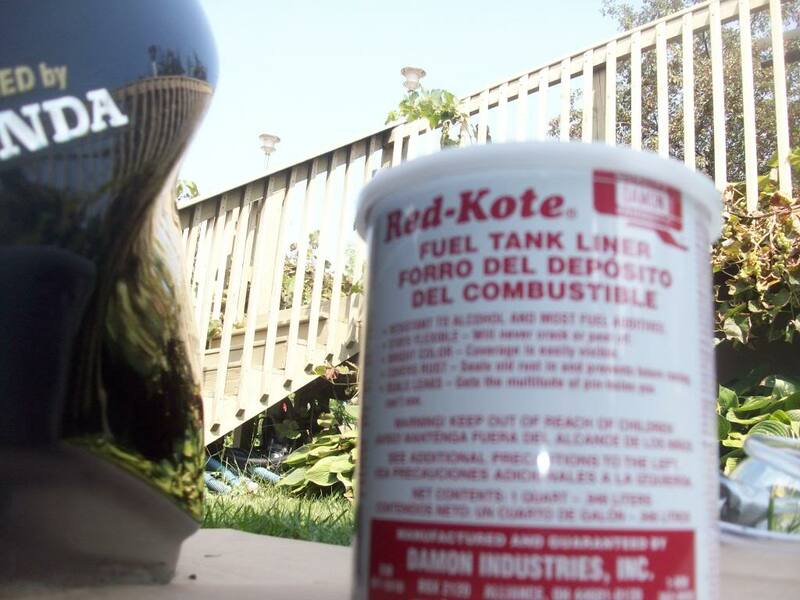 Also Red Kote claims that the sealer can be applied directly over rust. This may be a plus for people that have mild rust, or just can't get certain parts of the tank clean enough for other sealers to work. 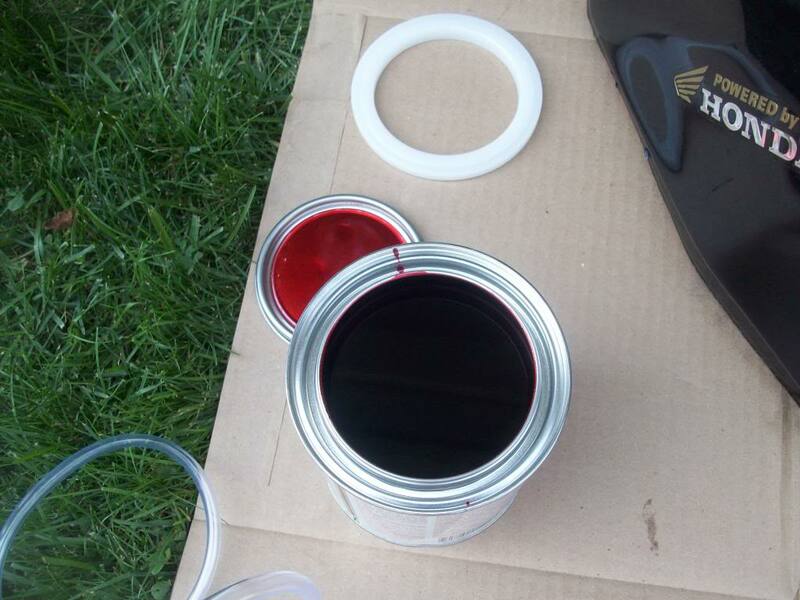 Use a funnel to pour the sealer in ( BE CAREFUL THIS STUFF WILL EAT THROUGH PAINT, AND STICK TO METAL). Once in the tank give it a good covering. Swirl around, tip on sides, whatever you need to do just be careful not to get air bubbles. Mine is loaded with them! Once you feel comfortable with the coat just take the duct tape off of the petcock hole, and let the excess drain back into the tin. When you are almost done grab the siphon and get the last bit out. Don't worry about touching the sides, if you mess something up just swirl it around a little more before it dries. I didn't have a siphon so what I did was move the tank around until the excess sealer dried. This method was poor, and I now have a lot of runs in the tank. I just flipped it every 5-10 minutes until the sealer was cured to the point that it did not run. Do not dispose of this stuff yourself!!!! I would recycle the chemicals at a waste plant. They say cure time is 8-24 hours. I let mine sit for just about 48 hours since I had a little excess in the tank (as mentioned), and just to really make sure this stuff didn't getting into my fuel system. 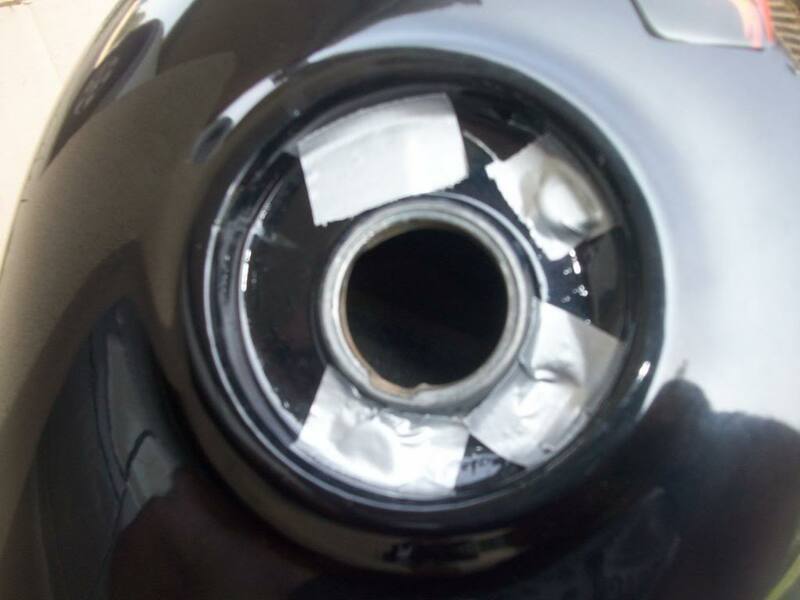 Make sure all of the tape is off at this point to allow maximum ventilation, and do not use any tools (air compressors, vacuums, blow dryers) to cure the sealer. JUST AIR DRY. Curing should be done in a clean environment because whatever gets in the sealer will not come back out. ALSO MAKE SURE THE PETCOCK IS CLEAR while curing. You do not want this stuff to block the petcock off. That is why I recommend using two chairs to support the tank just in case the petcock needs to drip. Check on the tank frequently while curing. Turned out pretty good in my opinion. No more rust in the fuel system, and a fix at nearly $40 usd compared to a new gas tank at $500+, or a used gas tank that might still have the same problems for over $100 easy. The gas comes out pinkish for a like a tank, but it doesn't effect anything. After finishing I would definitely put an inline fuel filter into the system, and new fuel lines. Do not be scared of doing this repair. It turned out to be easier then it looks. I am 19 years old, this is my second bike, and I have only self taught experience. So if i can do it then I know most of you can. This was a really good article. You are a very good contributor for posting it. I'm mechanically capable with stuff, but was nervous about dealing with the rusting tank issue. I definitely feel more confident than I did before. Thanks, I am glad it helped. I know there are a lot of guys that pick these old bikes up, and end up just buying a new tank or leaving the rust floating around. I might add that these sealers sometimes claim to fix pin hole leaks as well. 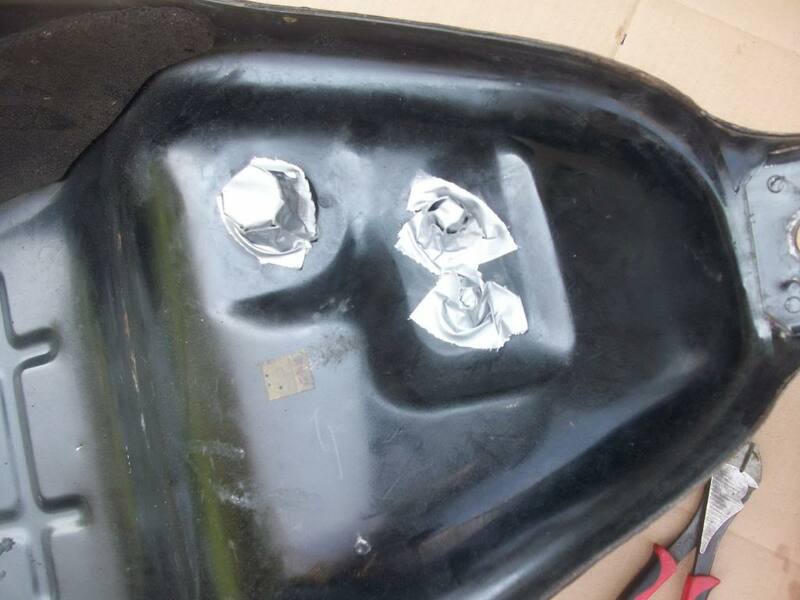 If the tank is rusted very bad then it might develop some pin holes after you do an initial cleaning.